On Friday March 30, 1990 at Nazareth College Performing Arts Center, I presented a concert of music by the late guitarist and composer, Stanley Watson. Stanley had been my guitar teacher and mentor in Rochester, NY during the mid 1970’s, and though I only studied with him for a little over a year, that year has kept me going ever since. Originally from Canada, Stanley grew up in England. 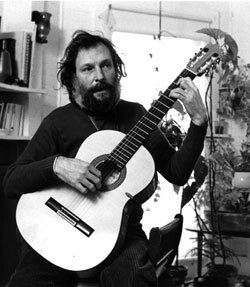 He then went to Spain, Italy and around Europe in the late 1950’s in search of guitar instruction, music, folklore and adventure and found it wherever it presented itself. His first and favorite teacher in Spain was a man who was a potato farmer by day and a guitarist at night. This eventually lead to studies with other teachers, including Andres Segovia. Along the way Stan attended master classes with cellist Pablo Casals to help develop left hand techniques. In France he followed Django Reinhardt around to learn jazz and right hand picking methods. He worked with dancers and artists in Paris and traveled to Portugal and Greece to soak up the music and culture. By the time he had made his way to Rochester he had married, started a family, was deeply immersed in composing and was sporting a handmade Ramierez guitar, “rare in them parts and them days”, and he had endless stories to tell. He embarked on a teaching and performing career in Rochester where he came in contact with Chuck Mangione. He can be heard on Chuck’s Mercury Records albums Friends And Love and Together. Stanley frequently played at local clubs, coffee houses and on radio and television. I’ll never forget Stanley opening a show to a packed house at the Rochester War Memorial for John McLaughlin and Frank Zappa! He seemed to be at home anywhere. His teaching was focused. You had his undivided attention. His music was transporting, vivid, personal. While traveling and living in America Stanley kept a kind of musical journal* of people and events that touched him or seemed important. He often said that if he hadn’t been a musician he would have been a painter. Stylistically his music was neither classical nor popular, rather a peculiar combination of both and more, uniquely his, drawing on earlier studies and experience. Stanley taught me only a few of his songs - the simpler ones. The rest I figured out years later from tapes I had made of some of those concerts during those counterculture years of 1973, ‘74, & ‘75. By 1976 Stanley had left Rochester, continuing his travels. Sadly, in 1978 he died from injuries suffered in a car crash on Rte. 95 near Portland, Maine. He is sorely missed, and is still remembered in music circles in Rochester. Learning and presenting this music was a high point for me. At the time the Guitar Society of Rochester was up and running at full steam. Its 1989-90 concert season included Leona Boyd, Carlos Barbosa-Lima and Gene Bertoncini, George Van Eps, Alice Artzt and Berit Strong. I felt privileged to be included with in this lineup and would like to thank John Weisenthal, Marcos Santiago, John Szulgit, John Yeager and all the other board members and people behind the scenes for helping make this concert of Stanley Watson’s music happen. Particular thanks go to Gary Chudyk for recording the concert and for his help editing this CD together as some of the material had to be redone. Thanks also to John Teleska for introducing me to Stanley in the first place. At the time, I figured I’d go into the recording studio after the concert and put it all on vinyl (different times), but I never got around to it and ten years have gone by. Flown by. Maybe down the road there’ll be a studio version of these and the rest of Stanley’s compositions (if I can figure them out.) Or maybe we’ll just put out a CD or two of the tapes I have of him, worn as they are. At any rate, time’s-a-wasting. Here then is some of the music of Stanley Watson. *Stanley made only a few recordings. One of them, a song called “Pages From A Journal On America”, can be found on an early Chuck Mangione album called Together (Mercury Records). “Songs From The Valley Of The Nightingale” can be found on Chuck’s first LP Friends And Love (also on Mercury). The Friends And Love concert is also available on DVD from Dynamic Recording Studios. Two other pieces, “Lullaby To An Unborn Child” and “La Danza Los Ninos”, can be found on Bat McGrath and Don Potter’s Introducing LP (on Epic Records). You will have to do some searching as these records are out of print. 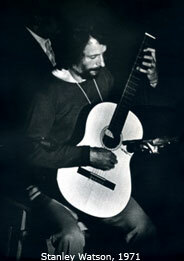 Noted fingerstyle guitarist Davey Graham (author of “Angie”) recorded Stanley’s “La Danza Los Ninos”. 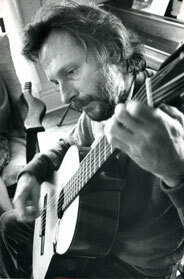 This can be found on an album of Graham’s called The Art Of Fingerstyle Guitar. “La Danza Los Ninos” is part of Stanley’s larger work “The Churianna Suite” which is on Kinloch Nelson Plays Stanley Watson.